Over the last few days, RingPlus has added several Mad plans and it is expected they will add more plans during this week-end. I am combining several posts from my Standard 7.5 blog on Blogger.com and adding some new updates from this morning, October 22, 2016. Unless you buy an Add On of Full Speed LTE data. Under the Free Plans (N.B. : several free plans are listed under Mad section above and not in the Free section). * Doesn’t specifically state the plan is only good for 30 days, but it is in the Mad Plans section for a free plan which is a good indication the plan is only valid for 30 days. Will update if the plan lasts longer than 30 days. *** Overages drawn from Top-up balance unless the balance drops below $2 in which case an auto-Top-up of $19.99 + taxes and fees will be charged directly to your credit/debit card. 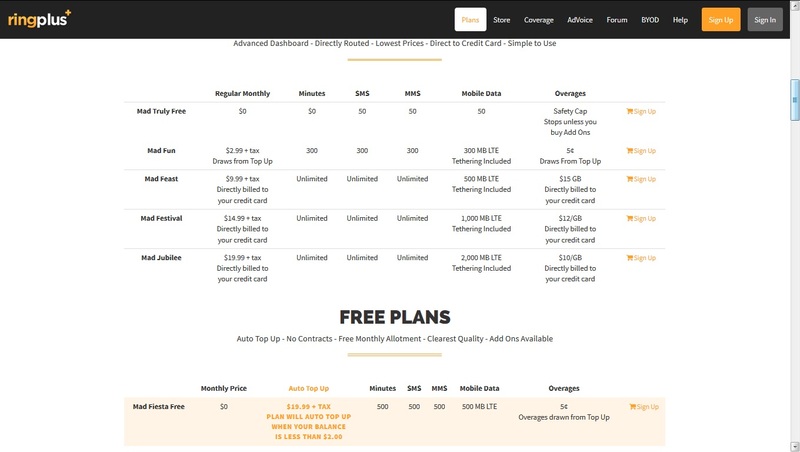 Tethering is included in the non-free Mad plans as noted in the screenshot. Tethering typically costs $20+ taxes and fees/month for most plans with some plans only costing $1.99 or $3.99 +taxes and fees/month. RingPlus has added new Data Device only plans this evening. They are found at the bottom of the activate new line page and not in the Mad section. Each plan includes Tethering and 0 Wi-Fi minutes. Directly billed to your credit card unless you buy an Add-On. Overages are $0.05/MB. If you don’t need a lot of data, then any of the Mad plans should work and the best in terms of price are the free ones and Mad Fun at $2.99 + taxes and fees. In other cases, choose one that meets your budget or text and talk needs. No word on if regular non-Mad Free or Premium plans will be offered which are routed through RingPlus servers. Mad plans are routed directly through Sprint so you don’t have some of the advantages and disadvantages associated with those plans. Interestingly, if you don’t need a lot of data, then four (4) lines at any of the above prices, including Mad Jubilee at $19.99 + taxes and fees/month would be cheaper than the old Mad Family plan which would have run $99.96 + taxes and fees/month compared to Mad Fun at $11.96 + taxes and fees/month or even Mad Jubilee at $79.96 + taxes and fees/month. Granted, the extra data for the Mad Family plan made it a better deal if you needed or wanted the extra data. Here’s hoping they bring it back for those wanting more data. Most fair-sized communities have enough free Wi-Fi points to reduce the need for large amounts of data. Same if you have a good Wi-Fi connection at home that you can use on your phone. Something missing from the new plans is device only plans (NOTE: Data Device Only plans were added after the original post was made). These were for tablets and other non-phone devices, but included limited data and Wi-Fi calling. Hard to say if they will bring those back, but it probably depends on how much users were signed up with them. Note: any existing plans have not (to my knowledge) been deleted so if you have an older plan, you should still have it. I checked with several people who have non-Mad plans and nobody has lost their plans. The unanswered question: will the free and premium plans come back? Or has RingPlus totally switched new plans to only Mad plans? I don’t know, but I am hopeful they will continue offering free and premium that aren’t Mad plans as they potentially have a large market if they did a better job of marketing them. These plans are designed for tablets and other non-cell phone devices. They are Mad plans which are direct Sprint lines. They don’t include the in-call apps available to traditional RingPlus routed lines. Unlike other Data Device plans previously offered by RingPlus, these don’t come with a limited number of Wi-Fi minutes. Good to see RingPlus adding some Data Device only plans for those who prefer to use non-cell phones for data. Looking forward to some non-Mad plans for the week-end as there are some rumors floating more new plans will be revealed this week-end. Disclaimer: I am not a RingPlus employee nor do I receive any form of compensation for any of my RingPlus (or other product service) posts. I am a mostly satisfied RingPlus customer who sees the value offered by the company.